While I’ve always heard about San Francisco’s fascination with seemingly strange fitness classes, I’ve never actively participated. I’ve never taken a spin class, I don’t go to Barry’s Bootcamp, and yoga is the only exercise I do regularly. Plus, I am easily distracted by random noises or rogue scents. What makes me an ideal candidate to try out the Bay Area’s trendiest treatments? If I can do it, anyone can. Weaving through the evening rush-hour traffic is not exactly the best way to clear your mind for a restorative yoga class, but I made it to the Feel Good Enterprises loft with one minute to spare. 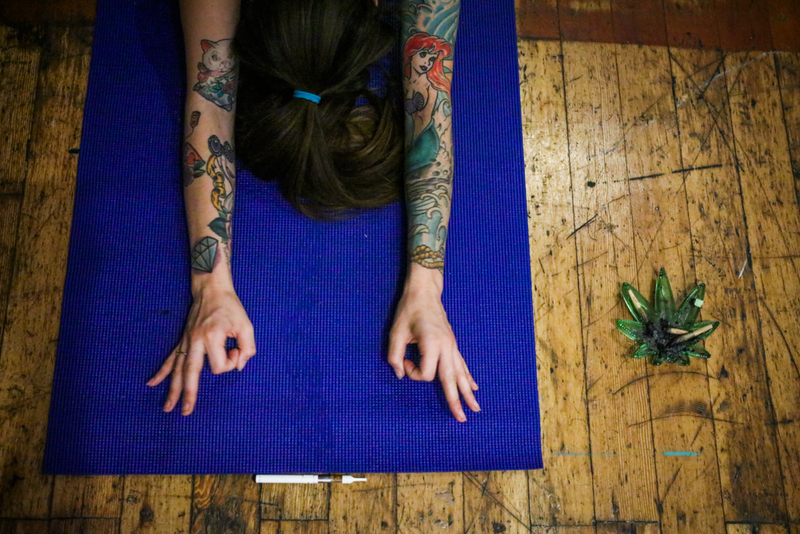 A very chill Dee Dussault, owner and instructor at Ganja Yoga, greets me, accompanied by the unmistakable odor of pot. It’s not a skunky bouquet, like what you may smell at Dolores Park on a sunny afternoon, but a lighter and somehow more sophisticated scent (cannabis companies Eel River Organics and Flow Kana provide the sacred herb). I’m not much of a toker, but for the sake of my art, I’m all in. 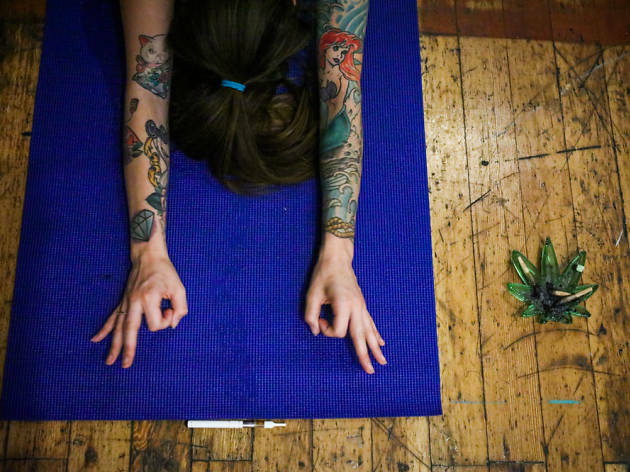 I enter the yoga space where small groups of people cluster, smoking joints near the open window, hitting bongs near the small kitchen or just lounging on couches. I grab a vape pen—filled with the gentlest strain, heavy on the CBD—and do my thing. After Dussault makes a quick round of intros, the hang-out sesh concludes—onto the mats we go. Dussault turns off the lights, arranges some candles and, in a soothing voice, tells us to relax. “Fake it till you make it,” she says. “Shouldn’t that be ‘Bake it till you make it?’” I say, laughing at my own joke. The slow-moving class is gentle, and the poses are few. I follow along, trying to figure out if I am high (maybe just a little), but I can neither relax nor restore. There are distractions aplenty. The biggest one is a raucous party, a mix of laughter and big-band tunes that I swear I can hear through the walls. This noise, combined with the soft music playing in the room and nonstop shadows moving on the ceiling, are too much for my senses to bear. I keep glancing at the girl next to me for signs of irritation—nothing. After class, I ask Dussault about the party. “Oh, that’s just the restaurant next door,” she shrugs. Sigh. I grab a MoonMan’s Mistress chocolate-chip edible and walk out the door. How I felt hours later: Overstimulated and hungry. Would I do it again? Maybe with a pal at a closer location. 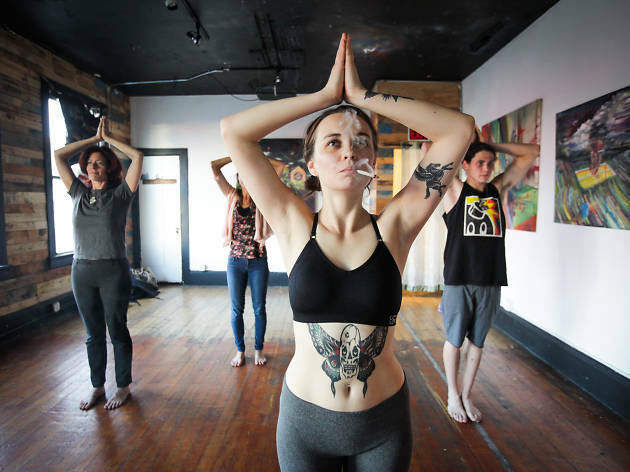 Various locations (theganjayoga.com). 90-minute class $30. Of all the wellness trends, I’m most worried about this one. I’m a fact-focused person by nature: I want to know everything, and I want proof. I tell myself these are excellent qualities for a writer, but for someone about to have a crystal therapy session…maybe not. 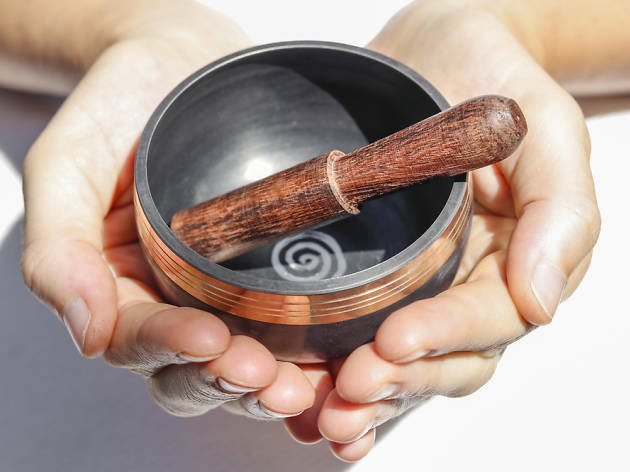 I really wasn’t sure what to expect during my 75-minute morning session with Tanya Corona, but I promised myself I would be open to whatever the spirits (see, I have no idea) would bring. Corona and her adorable pooch warmly greet me at the door. After some small talk, she looks me straight in the eye and asks me what’s going on, but I knew she was asking what’s really going on. As a private person, I find it hard to share intimate details with anyone, let alone a stranger. But I did. I recently spent an intense time on the East Coast caring for my mom after a major surgery, and I was still processing. Plus, I was stressed about money, dating—blah, blah, blah. Before I knew it, there were tears, and I wasn’t even on the massage table yet. Oy. 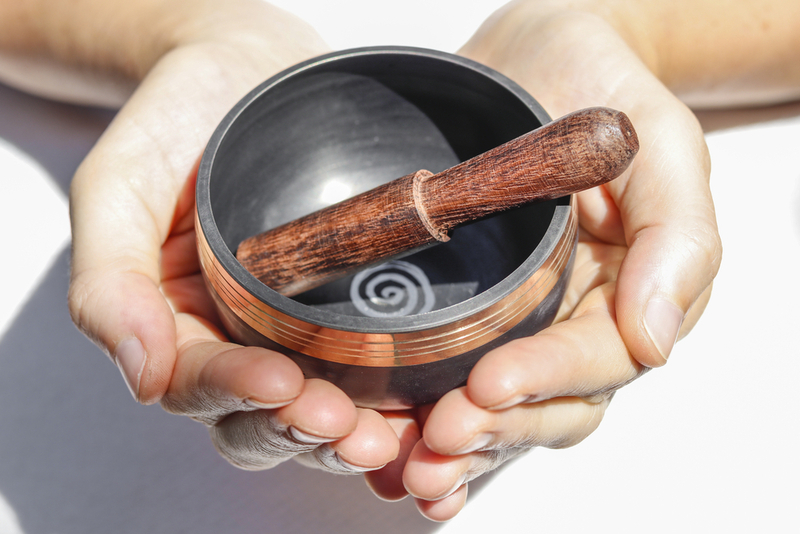 With soothing world music and the drip-drip of water in the background, I relax under a blanket, and Tanya’s healing begins—a combination of sound and crystal therapy as well as reiki. With eyes closed, I can feel where she is working and sense the energy moving within me as she moves from my feet toward my head. I am intrigued by the smell of sage, or something, smoking around me, and several times unconscious tears stream down my cheeks. When the curtains open and the session ends (wow, that was quick), I ask about that sage. “I wasn’t using sage, or burning anything,” she says. I am truly dumbfounded. We move to the couch, and Tanya shares what she saw, including my past life as a 19th-century nanny and the appearance of a peacock: a symbol not to take anything, including beauty, too seriously. She continues, hitting nerves and tapping into deep emotions, which I do my best to keep buried. The next day, I receive a comprehensive email filled with meditations, explanations of dream symbols and exercises to help further me along on “my divine path/life purpose.” Can’t hurt, right? How I felt hours later: Emotional, contemplative. 1069 York St (tanyacorona.com). 75-minute session $100–$200. I’ve heard people rave about the Pilates classes at Maiden Lane Studios, but I didn’t realize the space also offers fascial stretch therapy (FST). I sorta knew what it was—like, stretching was involved. I arrive promptly for my 55-minute session with therapist Kelsey Wiedenhoefer and immediately feel at home in the quiet, clean, minimalist space. I down a large cup of pink electrolyte water to make sure I’m hydrated, and my fascia (“the spiderweb-like connective tissue found in, around and between the joints, muscles and ligaments” according to the pamphlet) are ready for a workout. Next thing I know, I’m supine on a heated massage table—socks off, clothes on. The bodywork won’t require much from me: All I have to do is relax, breathe and listen to her directions, explains Wiedenhoefer. She starts by swinging, bending, twisting and twirling each of my legs and hips in between calls to inhale, exhale and relax, relax, relax. The latter is no easy task for someone with type-A tendencies. After about 20 minutes, I finally let go. It’s clear she knows what she’s doing (for example, she hasn’t once tweaked my bad knee). Using her own body for leverage, she moves me into all kinds of positions generally suited for pretzels and circus performers. I feel like an acrobat in my own personal Cirque du Soleil. My arms, shoulders and neck take their turn, and my tight upper body happily surrenders. A quick head massage follows and, voilà, it’s over. I feel good. I feel taller. How I felt hours later: Relaxed, a little dehydrated, much stretchier and suffering a lot less shoulder pain. Would I do it again? Absolutely. I’m going back next week. 80 Maiden Ln (415-274-9940, maidenlanestudios.com). Treatments offered daily; one-hour session $150. I am excited about my first foray into “float-podding” at Reboot Float Spa. I knew it was supposed to pamper sore muscles, help one relax, and even boost creativity. 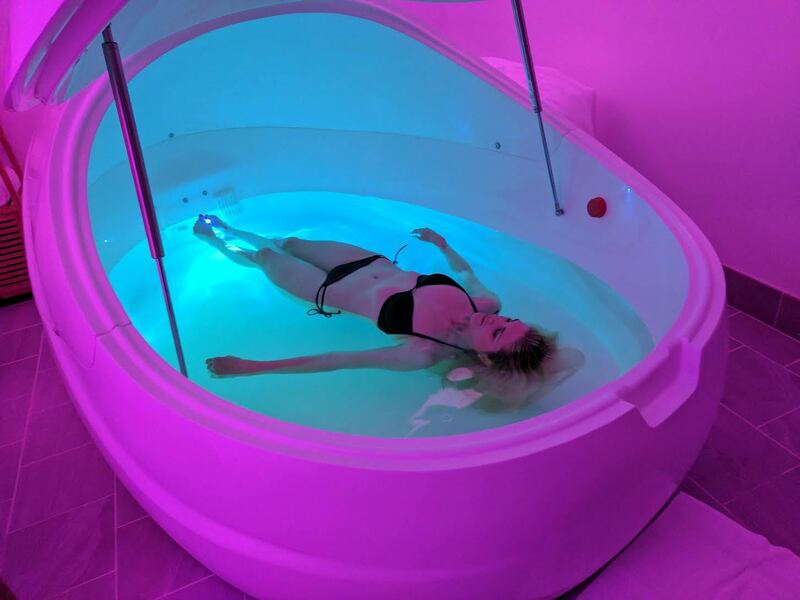 After a short intro video, I’m off to my float room to get naked and enter the futuristic-looking pod, filled with body-temperature water and 1,200 pounds of Epsom salt. The private room also has a shower with all the fixings: pre- and post-float soap, shampoo, moisturizer and so on. Freshly showered to rid the body of oils (according to my Reboot manual), I pop into the pod just as gentle classical music starts playing, a signal that the 60-minute countdown has begun. I take the guide’s advice and put a washcloth on the edge so that a little space and air remains when I close the lid. (Claustrophobes can keep it open.) Now to hunker down in my cozy cocoon. It takes a few minutes to acclimate, but after grabbing the float pillow for neck support, I am wrapped in the arms of full-on bliss. The video suggests counting to 300 to clear your mind, starting over as thoughts wander. All is going swimmingly for about 10 minutes, then the music shuts off; it doesn’t start again until the end of the session. Ruh-roh. I find myself obsessing over the state of the nation, my awful haircut and what I’m going to eat when I get out of here. (My stomach growls throughout.) After a while, I simply let the thoughts come, banish the counting and float. How I felt hours later: Calm, refreshed. 1912 Lombard St (415-494-9032, rebootfloatspa.com). One-hour session $69.